Everyone has a scrap recipe book. It’s that thing that holds the accumulation of recipes torn out of cooking magazines, and scribbled on scraps of paper, and printed out from websites. It’s usually a binder or a box that’s stuffed to overflowing with no discernible method to its madness. It’s full of recipes you make all the time, and recipes you’ve never thought about again after you stuck them in there. It’s a combination of recipes that you got from friends, and ones that you insisted your mother give you, and ones you just thought sounded interesting when you read about them and tore them out even though you know you’ll never ever make them. I periodically try to organize my scrap recipe book. This doesn’t usually involve actually throwing away any of the recipes because you never know, someday I might actually get around to making that recipe for peanut crusted fish with fried plantains. The first step is to move the loose collection of recipes that are hanging out on my kitchen counter and littering the front of my fridge to the notebook. This is usually about as far as I get before I run out of time or lose interest. 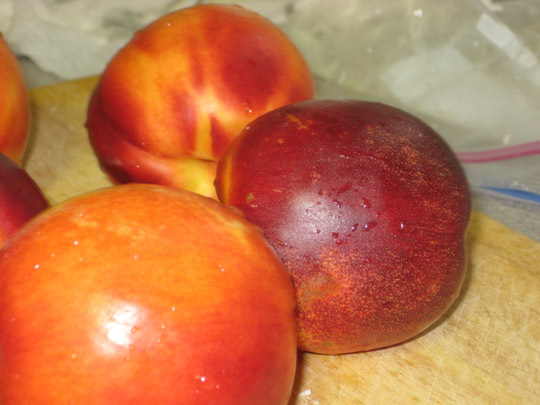 But occasionally I am very bored and I decide that I want to really organize the recipes. I want to create a filing system for them so that I’ll be able to find them again easily, at the snap of my fingers. Possibly even organize them so that other people can find them. This is the kiss of death. My mother is a librarian. Most of her friends are librarians. My roommate is a librarian. It has never in my life occurred to me to not file my books by author and then title – or, in the case of non-fiction, by subject and author. It drives me slightly nuts that my online TV guide alphabetizes by ‘a’ and ‘the’. My filing system at work is so ruthlessly organized that I can walk someone through it on the phone while I have a migraine. All of this, however, has no impact on my ability to organize my scrap recipe book. I’ve done it several times and each time it nets me a system that seems perfectly rational and clear as I’m doing it, and reveals itself to be deeply arbitrary and confusing two weeks later. I think part of the problem is that I try to make my system overly complicated to cover every recipe or ingredient eventuality – there’s a little niggling voice at the back of my mind that’s suggesting the application of the Dewey Decimal system right about now, but that seems extreme. I think the more fundamental issue is that scrap recipe books not only empirically defy organization, they willfully discourage it. They should be stuffed with stained pieces of paper and faded handwritten recipes in illegible scrawls. Leafing through them to find the recipe you’re looking for is part of the fun. It reminds you of all those things you’ve never made, or of that dinner your friends made that was so good you had to have the recipe. Of course, sometimes you have no idea where the recipe came from or why on earth you thought you’d ever make it, but that’s interesting too. I think too rigorous an organizational precept defeats the charm of the scrap recipe book. At least that’s my story, and I’m sticking to it. Cook’s Illustrated just devoted 2 full pages to how to boil the perfect egg which I thought was excessive even for Cook’s Illustrated. Needless to say, I also paid it no attention and went ahead and boiled my eggs the way I always boil my eggs (11 minutes at a simmer, drain and run under cold water until cool to the touch) and they came out just fine. It would never have occurred to me to put this combination of ingredients together except I had it at a restaurant once and it was delicious. Most of the time when I have things at restaurants that I really enjoy I have no clue as to how to go about recreating them. This, however, was really fairly self-explanatory. 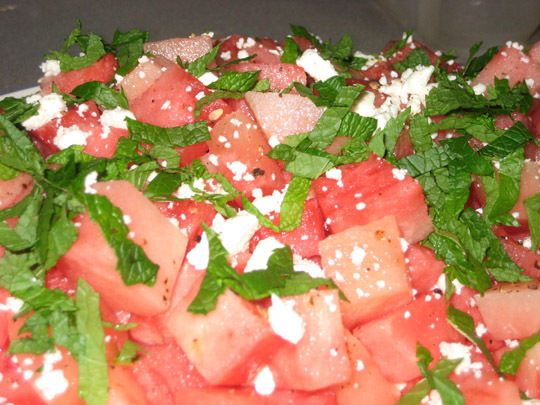 Remove the rind from the watermelon and cube into bite sized pieces. Arrange on a platter and crumble a small handful of cheese over the top. Sprinkle with chopped mint leaves. Grind some fresh black pepper over the top and drizzle with olive oil. This recipe came out of the most recent Cook’s Illustrated and I was curious. I think they taste more like dinner rolls than biscuits, but I was soundly vetoed when I voiced this last night so I think that’s just me. Someone last night described them as ‘not everyday biscuits’ which I think is accurate. They’re very moist, and indeed very fluffy. They’re also fairly rich because of the butter. And, as a result they actually aren’t good ham biscuits, although they’re quite good on their own. I think I’ll make the recipe again, but I wouldn’t serve it with this kind of dinner. I will say the biscuits are a lot easier to make than the length of the recipe would suggest. Grease a 9” cake pan and the inside and outside of a ¼ cup measure. Preheat the oven to 500. Spread the extra cup of flour on a rimmed baking sheet. Melt the 2 Tbsp of butter. Combine the dry ingredients in a mixer and pulse 5-6 times to combine. Add the 4Tbsp of butter, cut into chunks, and pulse until the mixture is the texture of coarse sand (I think you could probably use a pastry cutter to do this and avoid having an extra bowl to wash, but I haven’t tested this theory yet). Turn the mixture out into a bowl and add the buttermilk. Mix together gently with a spatula. It will be very wet and slightly lumpy. Scoop out dough with greased ¼ cup measure and turn onto the floured baking sheet. 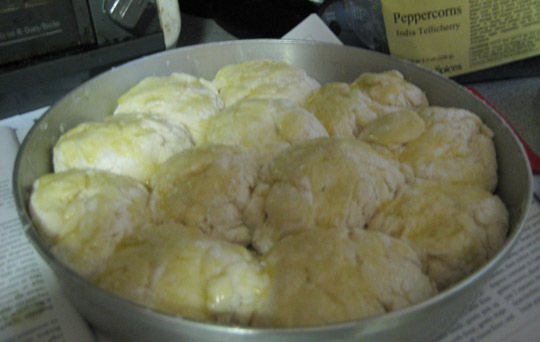 Repeat until you have 12 dough balls (you should have no dough left over). Turn the dough balls in the excess flour until coated lightly. Use you hands to loosely shape the balls and shake off the excess flour. Arrange 9 balls around the edge of the cake pan, and 3 in the middle. Brush with hot melted butter, taking care not to deflate the dough. Bake in a 500 oven for 5 minutes and then turn the temperature down to 450 for another 10-15 minutes until the biscuits are browned. 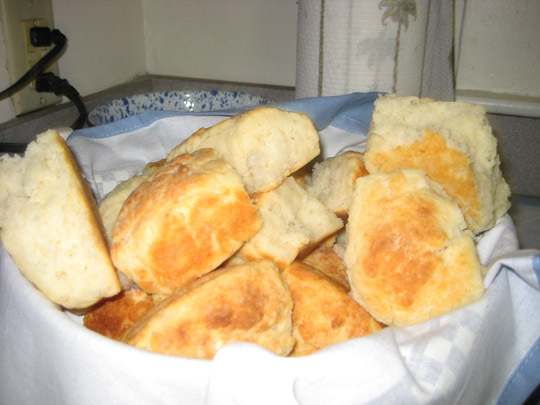 Allow the biscuits to cool in the pan for 2-3 minutes and then turn out on to a clean dish towel, break apart and serve. 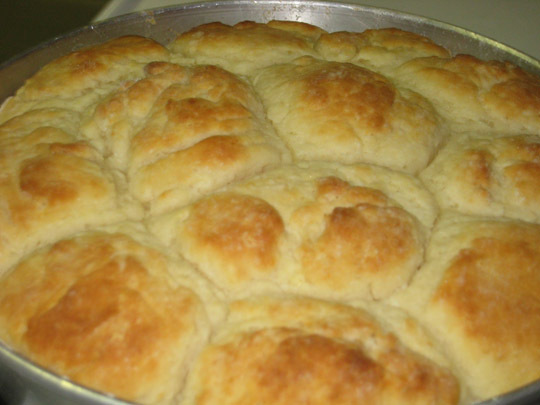 Maybe you are having a flashback to childhood and seeing Mimi’s potato dinner rolls which were made in a baking dish and vaguely resemble this. You are certainly on target there. For a variety of reasons, not least that I need the same recipes in multiple locations, mine are all typed on my laptop and since they are typed many are now printed out and neatly organized in ring binders. I can easily find any recipe, but I miss the memories associated with the original scraps. Although I do note on the recipes who I received it from and that brings back memories when I read it. Maybe? Although, honestly I don’t remember Mimi cooking. I remember making dinner and being in the kitchen, and I have vague memories of ham dinners when I was really little, but I don’t actually remember Mimi cooking.